Santa will be visiting the studio of Acclaimed Photography in Bothell for two days- December 8th and 9th. Please click the link to view the on-line schedule and full details on pricing and packaging. Santa photos in Bothell, WA. 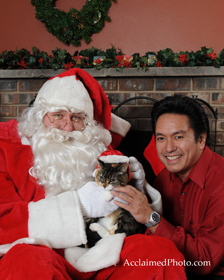 Reserve you Santa Photo in Bothell now! Tags: Bothell Photography Class, How do I use my camera?, How to take better photos, photography class, seattle photography class, What are these buttons on my camera? Ever think to yourself, “What are all these buttons are on my camera”? …”What do they all do”? Acclaimed Photography is now offering introductory classes for you to learn your camera and take better photos. -and more . . .
Santa is due to arrive at the Acclaimed Photography studio on Saturday December 2nd, December 3rd and December 10th. Santa is also available to come to your home and make a surprise visit. There will likely be more dates added. As a member of the SPPA (Seattle Professional Photographer’s Association) I was a participant at this year’s holiday party. 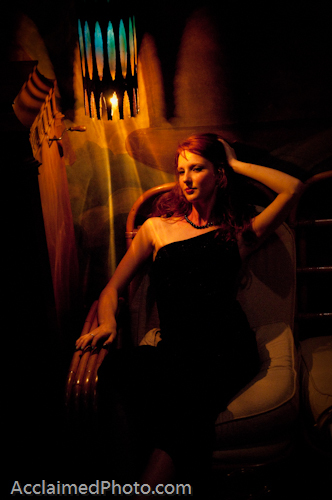 It was a particularly extraordinary event, primarily based on the venue and models. A photographer’s ‘shoot-out’ dream come true. 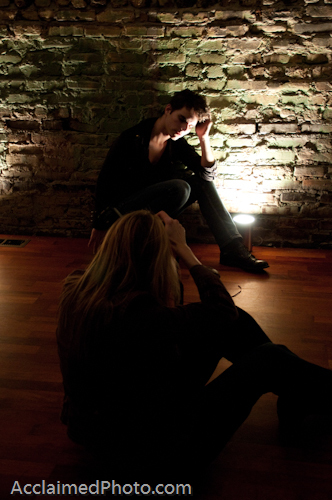 We rented out one of the coolest places in Seattle, Urban Light Studios, in Wallingford. Along with a team of @ 8 models, from Lumina Models in Everett….lots of photographers with their cameras…. made for an amazing night of creativity and fun! Here are a few shots from the evening. They have not been Photo-shopped at all. . . . Just meant to show how much fun we had. Enjoy! As you can see, we photographers know how to have a good time! This was a really fun holiday party and for all who participated I thank you! 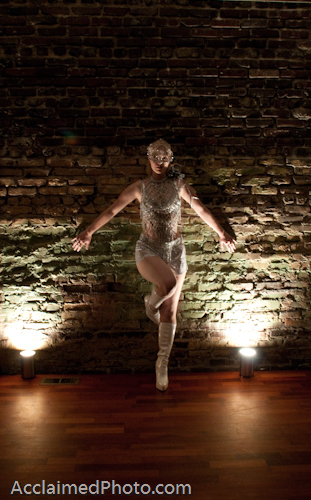 Tags: Holiday Party Ideas, Santa, Santa Baby, Low Light photography, Lady Gaga, Urban Light Studio. If you and your child are wanting to visit with Santa, without all the hassle of the mall, come visit us at one of the three dates we are offering this year! December 4th, 2010 10am-1pm at Willows Edge Farm. No appointment necessary… just drop by: 18505-51st AVE SE, Bothell WA 98012. We will be taking photos in the barn with a barn-themed backdrop. The photo below was taken there. We will be adding some more decorations for Dec 4th Santa photos. No pets please. Packages starting at just $20. December 11th, 2010-10am-1pm at Key Bank in Canyon Park/ Thrasher’s Corner 21105 Bothell Everett Hwy (next to Fred Meyer). No appointment necessary… just drop by and visit Santa. All profits from this event will benefit Special Kids Photography of America (a 501 c3 non-profit). Packages from $20. The backdrop in this photo is the same one we will use for this event (and we will have this backdrop available for holiday portraits at the Acclaimed Photography studio). 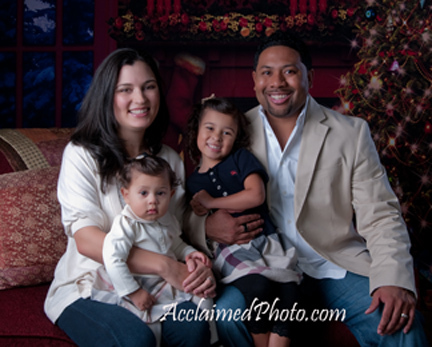 December 12th, 2010 (Sunday) from 10am-1pm **by appointment only** at the studio of Acclaimed Photography in Bothell, WA. Call our studio for an appointment. Packages starting at $20 and credit card is required to make an appointment to visit Santa at the studio. Pets welcomed at the studio. 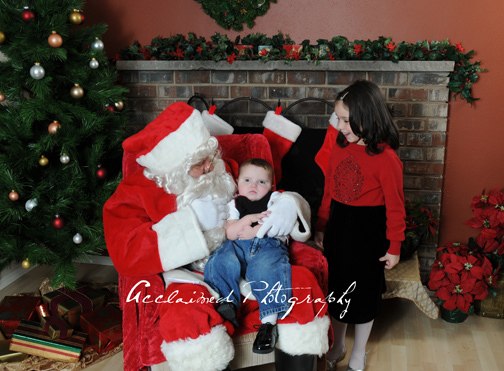 For any information regarding Santa photos please contact Kerri at Acclaimed Photography, 206-228-2442, http://www.AcclaimedPhoto.com. 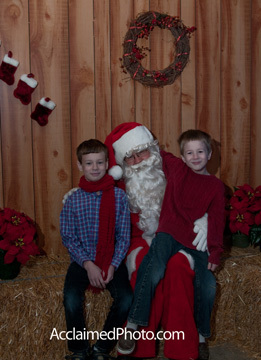 Key Word and Tags: Santa, Santa Photos, Santa Photos on the Farm, Santa Photos in Bothell, Santa photos at a studio. 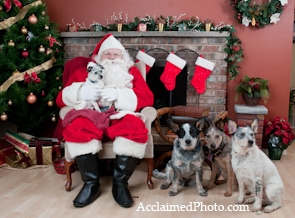 Santa photos with your dog, Santa Photos in Bothell, Santa photos at Key Bank in Canyon Park, Santa photos at Acclaimed Photography. I am putting on a fundraiser for Special Kids Photography of America (SKPA). 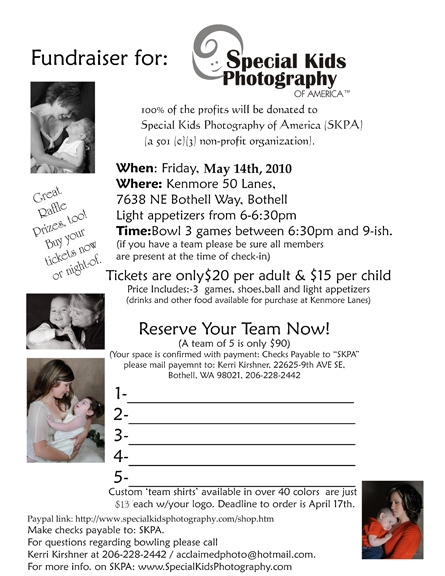 It will be held on Friday, May 9th, 2010 at Kenmore 50 Lanes, in Kenmore/Bothell, Wa. Light appetizers will start at 6pm and bowling starts at 6:30pm. 3 games, shoes and a ball is $20 for adults and $15 for children. Get a team of 5 together and it is only $90. Custom team shirts with your company logo are available for $15/each. Also, if you or your business can donate items that would be great. I’d like to have a raffle and sell tickets the night of the event.